Our reporters have learned that the government of Rwanda is in mourning now after its second setback when the Rwanda supported Burundian rebels who had attempted to attack Burundi was thwarted. This is another blow of the RPF government which has been a source of conflict in the region since 1990s after its baby Tutsi led rebel the M23 was crashed to the ground by the joint SADC force led by Tanzania and South Africa in 2013. After the defeat of the M23 whose scattered Tutsi rebels took refugee to Rwanda and Burundi Mr. Paul Kagame of Rwanda never gave up his bid to safeguard its quickly crumbling regime. he instead started courting the Burundian opposition through IKIBIBI Party which receives money from the Kigali government to destabilize the Burundian government led by Mr. Nkurunziza Pierre. According to our reporters the heavily armed group from southern Rwanda in NYUNGWE forest was defeated after five days of heavy fighting in Burundi. At least 100 people have been killed after a cross-border attack against the security arms of the Burundian government led by Pierre Nkurunziza from the Southern Rwandan forest of Nyungwe which creates suspicion of the role of the kigali government in supporting these rebels. Here we can remind our leaders that our sister newsonline Karisimbi Online had published a confidential information from the Rwandan intelligence that detailed the RPF plans to send Tutsi prostitute to Bujumbura to gather intelligence on how to invade the country of Burundi. Some Burundian military general in the Burundian army who spoke on conditions of anonymity on Thursday told KIGALI EVENING NIGHT that the raid by the rebels supported by the Kagame government and some of the Burundian oppositions parties including IKIBIRI had been thwarted after some days of heavy fighting in the border area north of the Burundian capital of Bujumbura. "It is true that after some days of non-stop military fighting in the northern Burundi, the armed group which attacked Burundi has been wiped out by our security forces. 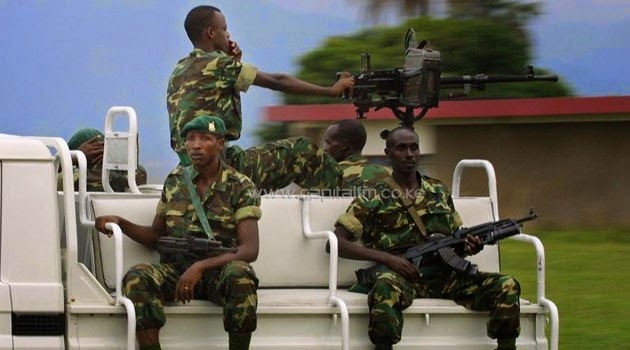 More that 200 armed men were killed and over a 100 were captured, Our reports say that more than 400 armed men had entered Cibitoke province from our neighboring countries," the general said. "We also seized a 60mm mortar, five rocket launchers, machine guns and more than 100 assault rifles and some of them have serial number of the Rwandan military equipment." The general said the Burundian army had lost two soldiers. Other military sources said that around 12 soldiers were killed in the fighting. He further said that more than 23 people captured by the Burundian army 7 of them have Rwandan military uniform which confirms the general belief that Rwanda has a hand in the attack. There was no further confirmation of the claim, with Colonel Gaspard Baratuza, army spokesperson, declining to comment officially on the fighting "while military operations in the area are still in progress". A previous toll given on Wednesday put the toll at 35 dead, including 34 rebels and one government soldier. Burundian officials and witnesses said the group of unidentified fighters crossed into the country overnight on Monday from Southern Rwandan forest of Nyungwe and another group was from eastern Kivu region, a chronically unstable and resource-rich area that is home to dozens of rebel groups.